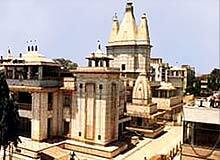 Nashik is famous as one of the important pilgrimage centers of India. According to mythology Rama, the king of Ayodhya, made Nashik his temporary residence during the 14 years of his exile. Besides its religious importance, Nashik has been a center of trade and commerce for centuries. Nashik finds mention in ancient Indian literature as well. Poets like Valmiki, Kalidas and Bhavabhooti have paid rich tributes to Nashik in many of their works. A mixture of ancient and modern values, Nashik is a bustling township. There are several forts and temples in Nashik. Nashik is also the home to many industries. The Security Printing Press of the government, which prints the nation's currency, is located here. Nashik is also known for its fruits and vegetables. The yield of grapes, strawberries and onions in Nashik is amongst the highest in the country. Ramkund is a holy tank and was built in 1696. Legends have it that Rama and Sita used to bathe in this tank during their exile. It is believed that by immersing a dead person's ashes into the Kund the soul of the dead person can attain moksha or liberation. The Muktidham temple at Nashik is built with pure marble, signifying holiness and peace. The most spectacular thing about this temple is that 18 chapters of the Gita are written on its walls. The famous Kalaram temple was built in 1794. The temple was built with black stone, brought from the mines of Ramsej Hill. There is a beautiful gold-plated copper peak on the temple. Inside the temple there are statues of Rama, Sita and Laxman. All these icons are lavishly decorated.